Happy almost Friday!!! We're so close, and today we're finishing up the 2013 Pantone Spring week with another bright color. Lemon Zest. I just love this sunny hue because it isn't a pastel yellow, it's got a buttery quality to it. You guys, ready-to-wear for work under $30. This is the perfect pencil for spring or paired with patterned tights right now. Nothing mid blowing about this sweater, but in my opinion, a solid cable knit crewneck is critical in any wardrobe. It can pull together any outfit or you can carry it along instead of a jacket. Simple. Fun. And great for an arm party. How about this for work or play? Layer an oxford under it or maybe a collar necklace. I just love the color. Lemon zest is such a punchy color. I think it's perfect for any time of year, even maybe on your nails! 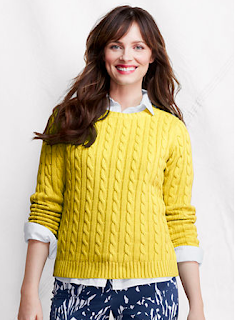 Oh, I love a pop of bright yellow in wintertime!